India’s only listed e-commerce company has just had a nightmarish day at the stock markets. 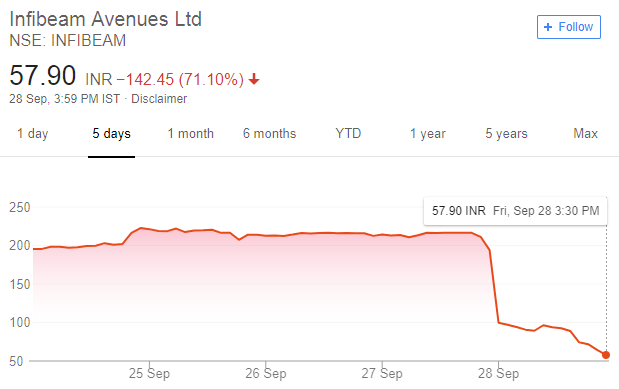 Infibeam’s stock crashed 71% today, ending the day trading at a price of Rs. 57.90. The stock had begun the day trading at a price of Rs. 180, but fell to Rs. 100 within the first 15 minutes of trade. It continued its decline for the rest of the day, at one point losing 73% of its market value. It ended the day 71% lower at Rs. 57.80, having eroded Rs. 10,000 crore of investor wealth in a matter of hours. If reports are to be believed, the dramatic sell off was caused by a single WhatsApp message which circulated among traders and raised concerns about the e-commerce company’s accounting practices. The WhatsApp message alleged, among other things, that the company had given interest-free and unsecured loans to its units. The message had been attributed to brokerage Equirus Securities Pvt Ltd, and had been first sent a few months earlier, but appeared to resurface today. It didn’t help that the Indian stock markets have been on edge over the last few weeks. Infrastructure lending company IL&FS defaulted on its bond payments earlier this month, which led to some fears around the NBFC space — last Friday, Dewan Housing and Indiabulls had seen their stock prices fall by as much as 50%. The fear had spread to the banking space as well — Yes Bank’s stock has also fallen 50% after its CEO Rana Kapoor was asked to step aside by the RBI. Infibeam, for its part, made voluntary clarification to exchanges after the fall, saying there was no pending information or announcement that may impact its share price. Infibeam’s fall, though, will raise some eyebrows among those who follow India’s e-commerce space. When it had listed on the stock markets in 2016, Infibeam had been the poster boy of the e-commerce space in India — as rivals like Flipart and Snapdeal had been burning through large amounts of cash trying to sell goods, Infibeam had pivoted to the software space, selling cloud solutions for merchants who sold their goods on the various e-commerce sites in India. Over the quarters, it had consistently grown its revenues and profits — for the quarter ended December 2017, Infibeam had reported a profit of Rs. 30 crore. Over the last few years, India’s e-commerce startups had been pilloried for running nonviable businesses whose losses were too high and who could never hope to make any money. Their valuations too, were though to be bubbles — Snapdeal, it was believed, was valued too high at $6.5 billion, and Flipkart’s $15 billion valuation was unsustainable. In these discussions, Infibeam was often shown to a comparable company whose value was determined by the actual stock markets, not by a group of venture capitalists. But if the events of today are any indication, Infibeam’s valuation might have been the biggest bubble of all.